Online dating, at least in my experience, seems to involve a lot of talking to strangers about their CrossFit routines. So it’s understandable that people would want something—anything!—that promises to make sifting through the endless stream of single humans a little easier. Enter The League. The invite-only dating app was launched earlier this year by Carnegie Mellon and Stanford Business School alum Amanda Bradford. The app promises to “curate” the online dating experience for young professionals who are “smart, busy and ambitious” and living in centers of industry like San Francisco, New York and London. The app’s look is glossy and minimal, in startup-approved shades of turquoise and dark grey. Promotional photos are a procession of white faces in urban-preppy environments: ball games, rooftops, Montauk. Like Raya, the dating app geared towards celebrities and the people who vaguely know them, the League promises to pre-vet its young professional users so they don’t have to spend time weeding out “fakes” and “randoms.” We know you’re busy building your empire and you don’t have time to deal with the bs found on those other apps, the site’s copy confides. The League’s launch earlier this year has been thoroughly covered via mostly snarky, occasionally promoterish articles. 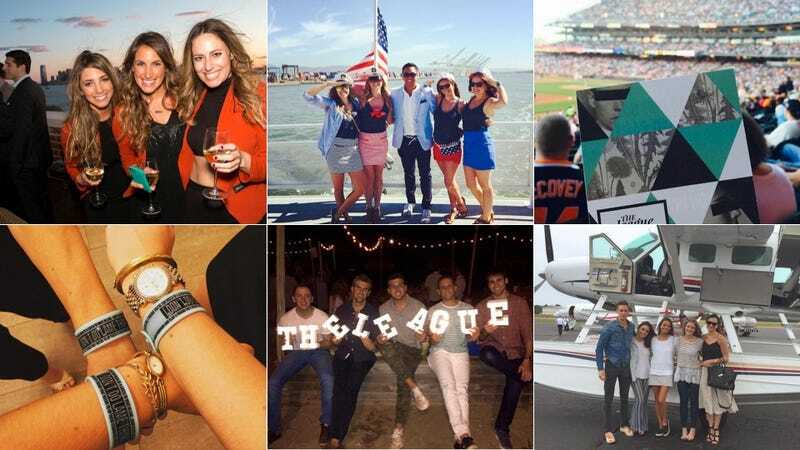 The press surrounding the app is hardly surprising, as The League is a Venn diagram of at least three perennial favorite media topics: elitism, online dating, and tech startups of questionable relevance to the average person. But the basic idea around The League isn’t new. It’s just the latest entry into a niche market of sites, apps and services aimed at graduates of elite schools looking to date others of their kind. These services have long thrived in the back pages of alumni magazines and on Facebook’s sidebar ads. If you are a graduate of an Ivy League or any school that fancies itself similarly special, you may have seen ads for The Right Stuff or Sparkology. These sites cater to affiliates of elite schools and college-educated young professionals, respectively. The League just has more startup capital. It makes sense that highly educated people are looking for other highly educated people to date. If your passions include Foucault, Restoration comedy or quantum mechanics, it’ll be tough to find a match on Tinder who relates. If you log 80-hour workweeks, you may not want to spend your negligible free time combing through a list of OkCupid matches. Today is an age of efficiency, and knowing that fellow users are more likely to share your interests is an alluring proposition. But there’s another dimension at play, and it’s an economic one. The University of Pennsylvania studied marriage trends between 1960 to 2005, and found that people are increasingly likely to pick a partner with similar education and income levels—a trend that is contributing to increasing income inequality. The study noted that if people went back to picking partners who were less socioeconomically similar, as they did in 1960, matches would have the effect of actually decreasing income inequality. I can’t tell if elite dating sites are proliferating as part of the larger ecosystem trying to specifically draw off the OKCupid and Tinder population, or if they’ve just always been in the background for certain types of people. But their existence seems inextricable from larger socioeconomic trends of increasing credentialism and income inequality. Their advertising explicitly invokes the language of college and the workplace, reminding you of just how people end up with Ivy League credentials and elite jobs. “I’m gonna call you my SAT score cuz you are perfect,” reads a League-branded shirt at a San Francisco event. According to a report from 2009, SAT scores correlate most strongly to a student’s household income. So if people are dating based on these kinds of credentials, it means that—whether they know it or not—they are dating based on socioeconomic status. And of course, people dating within their own class isn’t a new phenomenon. It’s how things have been in most societies during most of history. But what’s different between our current era, and, say, Georgian England, is that people seem a lot less aware of how class plays out in their everyday lives. The idea of the meritocracy prevails. Ironically, class plays an increasing role in Americans’ future prospects. For instance, a lot of jobs and opportunities are accessed through elite social networks. People who are excluded from these social networks have a harder time accessing career opportunities, such as an inside tip that a company is hiring, or a recommendation for a job from a friend at the company. If you’re locked out of elite social networks, you probably rely on publicly-listed jobs with buggy online application systems and hope for the best. Apps that promise to help people date within their own class probably aren’t helping. But it’s hard to blame a handful of apps and websites for a trend that has been on the rise decades before the internet even existed. Even if such apps didn’t exist, people would still probably find ways to make sure a prospective partner fulfilled certain criteria. Love, and a bare sense of upward mobility: it all provides a sense of comfort in a world full of one-sided conversations about CrossFit.